"There is a culture of entitlement versus the culture of performance. We believe in the culture of performance. Nobody takes anything for granted," said TCS CEO. How did Tata Consultancy Services (TCS), India's largest IT services exporter, become the company it is today? The well-oiled engine of the company continued to chug even during the global meltdown of 2008/2009, after the collapse of Lehman Brothers. 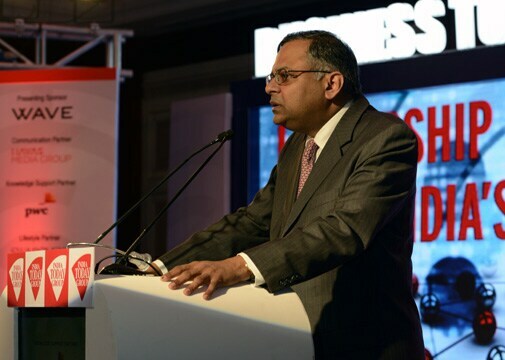 N Chandrasekaran, CEO and MD of TCS, shared the secret sauce at the opening of Business Today's MindRush 2014, an annual conclave of business leaders. It turns out the $13.4 billion company did what, conventionally, businesses don't. During good times, businesses press the growth accelerator, decentralize, and continue to grow even at the cost of inefficiency. Efficiency is driven during bad times. TCS, Chandrasekaran said, decentralized the company aggressively even during 2008/2009 - the company was split into many smaller business units. The management travelled around the globe, interacting more with customers. "Third, the tablet revolution was taking shape. We identified five technologies and invested in them, adopted them," the CEO said. Finally, the company edged on its 200,000 employees to aspire more and realize their potential - make a difference to somebody else. Who better to inspire them than the CEO himself whose personal story is inspiring - Chandrasekaran turned to software after growing bananas, rice and sugarcane on his father's farm. After his talk, India Today Group Chairman Aroon Purie asked Chandrasekaran how he planned to stay on top. What about the future? "You got to be paranoid," Chandra replied. "There is a culture of entitlement versus the culture of performance. We believe in the culture of performance. Nobody takes anything for granted."